It is safe to say that THE JEWEL OF RUSSIA WILD BLUEBERRY INFUSION is unlike any other product currently available in the U.S. This traditional Russian spirit is a comtemporary classic in the making and something that must be sampled to fully appreciate. The Jewel of Russia Wild Blueberry Infusion, and its sibling, THE JEWEL OF RUSSIA BERRY INFUSION, are each made according to a distillation technique devised 300 years ago. The fresh wild cranberries and bilberries used in the two infusions are handpicked and crushed in a vat. 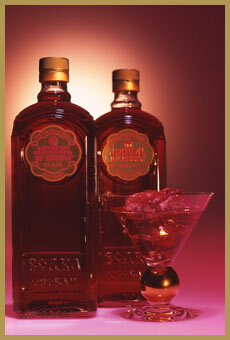 Superpremium Jewel of Russia Vodka is then steeped in the mash of fresh fruit for an extended period of time. As a result, the vodka is infused with a lavish fruit flavor and aroma. Each Jewel of Russia Infusion is remarkable. Each has a lustrous, red color and satiny, lightweight bodies. Their palates are similar and brimming with the luscious flavors of berries and a hint of chocolate. The favors persist throughout the lingering finish. Blindfolded, one would be hard pressed to identify them as vodkas. The infusions are relatively low in alcohol (40 and 44 proof), so there's no excessive heat or biting edge. They are ideally served chilled, or featured in a bevy of cocktails.